Flavourful beef patties with onion, celery, blue cheese and Tabasco Buffalo Style Sauce mixed in. Served on a toasted bun with zesty Buffalo Mayonnaise made with Hellmann’s® Real Mayonnaise. 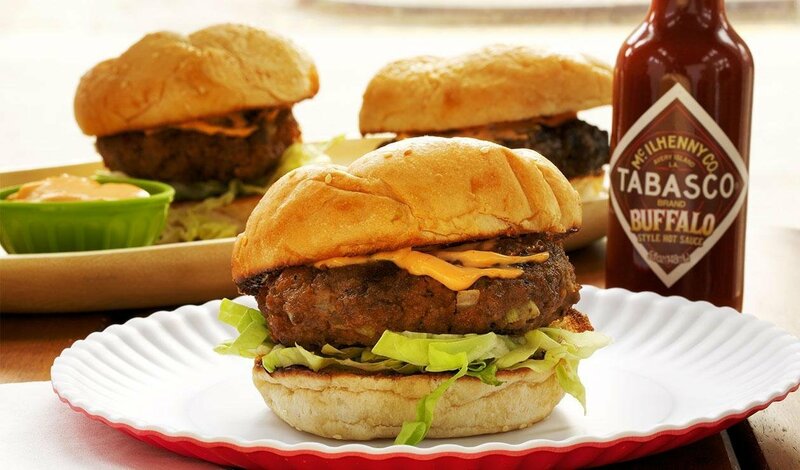 In a medium bowl, combine the beef, onion, celery, cheese, 7.5 Tbsp of the Tabasco® Buffalo Style Sauce and salt. Form the meat mixture into 8 patties. Wrap and refrigerate until ready to cook. Combine mayonnaise, ketchup and remaining 1 TbspTabasco® Buffalo Style Sauce in a small bowl and refrigerate. When ready to serve, heat grill to medium. Cook burgers over medium heat until just cooked through, about 5 minutes per side. Toast buns and place burgers on buns. Top each burger with the Buffalo mayonnaise and shredded lettuce.